Chat Bots are useful. I’m using several of them on a daily basis (mainly for the SaaS products I already use like Google analytics, mention etc…) and find them useful. I’ll probably use / try more of them in the months to come. We’re still at the “education stage”. Users still need to figure out how to install and use them, as well as what’s the real benefit. Same on the “builder” side, we’re still learning what the real potential is. Too many bots for the “low hanging fruit” use cases. Many bots aim at solving the first obvious “problems” like meeting management or on-demand services interfaces. We are going to see a peak followed by a crash. Missionaries vs mercenaries. As with every “hyped” field, chat bots attract a lot of entrepreneurs who are jumping in because they have no other ideas, no particular vision / mission and are following the hype. Starting is easy, persevering is harder, so again we are going to see a peak followed by a crash. How friendly are messaging platforms going to be with their ecosystem? We’re still at the infancy of these platforms so I have no idea how the different messaging platforms (Slack, Messenger, Whatsapp…) are going to play this out. How friendly are they going to be with 3rd party players? Which features are they going to internalize (= kill existing 3P tools) and which are they going to let in the hands of 3rd party tools? How will their APIs look like? How are they going to let 3rd party tools monetize? That’s still my #1 concern. Are chat bots a “nice to have” or a “must have”? Currently more a “nice to have” in my case. Are bots going to be platform specific or is there space for cross-platform ones? 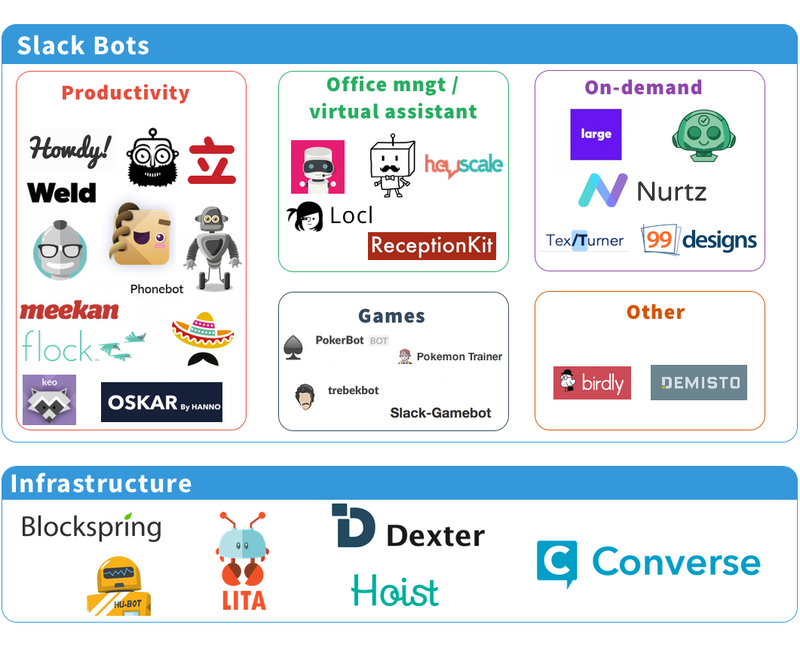 Which platforms will be best suited for monetizing a bot? Are users ready to pay for stand alone chat bots? At scale? As you can see I have far more questions than answers :-). What is sure is that chat bots are useful and are a great feature for existing products. So we’ll see more of them (and probably more “infrastructure” services to build them without reinventing the wheel).